Volusion is a shopping cart that many of our clients have used over the years. It's one of the longest established remotely hosted shopping cart platforms on the internet. Volusion is a cart that you can get lost in. The more feature-packed a shopping cart is the more difficult it is to administrate. If I am honest, I procrastinated a little bit before digging into the review because I knew that it would have me locked up in my office staring at menu after menu of administrative interface. I will say it right from the start that Volusion was a pleasant surprise to work with. As much as is humanly possible, I believe that Volusion has been optimized to make creating an online store pain-free wherever possible. Volusion has been under development for over 10 years. It's no longer just a "shopping cart software". For a small to mid-sized business, Volusion has the potential to be the hub of your online infrastructure. It can do much more than just handle basic e-commerce transactions. It can do advanced functions like handling customer accounts for recurring billing, newsletter blasts out to customers, keeping track of affiliate commissions, and providing detailed store analytics. With this much functionality it's impossible to dig into everything, but each feature has been well thought out and implemented in such a way as to be approachable to use for even the least tech-savvy of users. I am not a wholehearted believer in the "everything and the kitchen sink" approach, as I have always believed that a tool that tries to be everything is not as good as a purpose driven tool that exists only to accomplish something specific. The same logic applies here. The newsletter / email blast functionality of Volusion is good, but it is not as good as a purpose driven email blast software. That may come off as a criticism, but it's a very light one. If you take into mind the profile of the type of merchant that Volusion is meant for, the value of these features becomes tremendous. Volusion is meant for smaller businesses. These are businesses that if Volusion didn't offer email blast functionality, might not have any email blast capability at all. They are also businesses that even if they had purpose built email blast software would not be taking advantage of the extra features that Volusion may be lacking in any particular department. In other words, these tools are very functional and will meet the needs of a majority of small businesses. 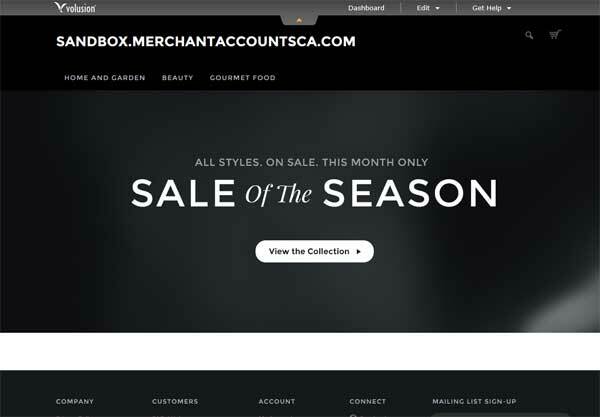 They are tools that many online merchants wouldn't even have if they weren't packed into the cart offering for free. When you first login to the dashboard you are encouraged to register a domain name through Volusion if you haven't yet done so. It also explains that you will need to setup some sort of payment processing and may need a SSL certificate. Step one is not so much of a configuration step as it an overview about what you will need to do before you can start processing payments. At first glance in the dashboard you will notice that most menu items have helpful tooltips (on mouse hover) that make setting up the store quite easy. For the most part I did not need to reference the help documentation and was able to go through and configure much of the store on my first attempt. The first step in configuring your store is the template selection. This is an area in which Volusion excels. There are over a hundred extremely clean and modern templates to choose from. Some of the templates are free whereas others are paid. The free templates do not "look" free. In fact, while there are a few basic looking templates, the majority are very nicely designed and are definitely usable. Some of the paid templates are beautiful, to the point that they look custom coded websites. The pricing of the paid templates range all over the place from $50 all the way up to $895. For the majority of users the free templates will probably be sufficient, at least to begin with. I chose to use the newest free template that had been added to the repository which was called "District". It had a very modern flavor with large fonts, a large degree of negative space, and a lot of the content located below the fold (requiring users to scroll down the page to view additional content). For a free template, I thought it looked beautiful. With any remotely hosted shopping cart software learning the template system has at least some learning curve to it, and is almost always overwhelming at first. Volusion is the same to some degree. However, this is also where it shines. What they have done is make the preview of your live store editable. If you click the "Storefront" button in the dashboard it launches your Volusion website in a new browser window. You can surf and navigate the store as normal. However, each element on the page when hovered over with the mouse has an "Edit" button. This allows you to edit the elements and add new content from right within the browser window. This makes it easy to find what you are looking for when working through the template system. For basic users a the WYSIWYG editor is the easiest way to quickly locate and make a simple edit. Making basic edits turned out to be so much easier than I anticipated that it may have built up my expectations when it came time to attempt some more invasive edits to the design. Customizing the template turned out to be an odd point of friction for me as I attempted to dig into the templates. Advanced users will be happy because you have access to edit the source code of both the HTML template and also the CSS file. I was quite happy to see this, but at the same time felt that there was an unexpected "gap" between making a simple edit and going full bore into editing the source code of the template. The problem was that I was mostly happy with the layout and wanted to add a relatively simple two column text area below the header graphic that stretched across the top of the home page. I wanted to create two columns of copy that would be sandwiched below the main header graphic and above the featured items that are located on the bottom half of the page. Using the basic WYSIWYG page editor I was having a hard time forcing Volusion to accept the newlines that I wanted it to render for extra vertical spacing below the main header graphic. I was not able to get it to accept the edits that I was attempting. I am certain this was my error and that there would have been a way to do it, but it was not intuitive. When I hit the brick wall it was time to stop using the WYSIWYG editor and dig into the source code of the template by using the File Editor. However, this turned out to be much less intuitive. Changes like this require a fairly significant investment in learning the template structure. This is the only area in which I feel the Volusion template system could use some improvement. I felt that I should have been able to create and move elements on the page from within the WYSIWYG editor. Specifically, I felt I should have had at least some drag and drop functionality within the WYSIWYG to push and resize elements on the page. This feature was not available. I am certain that I could use the file editor to modify the source code of the template and accomplish the design that I wanted. However, I felt that it was overkill to require manual editing of the template code in order to add a relatively simple field to the page. The components of any particular page of a Volusion store are broken up into what Volusion refers to as "Articles". The "Home / Welcome Pages" for my template was made up of 7 articles. The problem that I had with making advanced granular edits was that it was not clear which Article was being populated into each different area of the template. For example, there was an Article called Above_ProductList1. Using the Site Designer Tool I could easily click on it and edit this "Article". I could add tables, images, CSS, or just about any type of element I might want rendered in this field. The actual process of adding content was clean and straight forward. However, I had no idea whatsoever as to where this field was actually going to be mapped out and rendered on the page when viewed in my browser. In other words, there are many different Articles that can be edited (and new ones created), but there was no "map" to follow to help me understand where these different Articles would appear on the site. It is safe to say that if I had put more time into learning the template system I would have achieved a better understanding of where the various elements render on a page. However, the lack of being able to see where various components are mapped to within the template requires a bit of trial and error. Anyone that has read one of my shopping cart reviews knows how much importance I place on support. Support is a major concern in any situation, but especially for remotely hosted shopping carts like Volusion. Remotely hosted shopping carts are often used by smaller businesses, particularly folks that do not have enough resource or technical expertise to run a locally hosted cart on their own servers. If you do not have your own technical team to support you, it places that much more importance on the support provided by the shopping cart because you may need help to get your store live. My experience with the Volusion support team was pretty fantastic. Telephone support is available 24 hours per day. When making the design edits I reached out using Volusion's online chat support at 5pm EST on a Monday. There were 6 people in the queue and I was able to chat with an operator within 5 minutes. The online chat support seemed moderately helpful. I asked some questions about customizing the design. They understood the template system and were doing their best to help me. They notified me that although they are happy to help with questions about the template, they couldn't help with specific HTML or CSS related questions (which in fairness to Volusion are well beyond the scope of basic shopping cart questions). After my online chat I decided to try the telephone support and had zero wait time. I asked multiple questions about the design editor to get a general understanding of the template system. The support agent spent over 20 minutes with me, with nearly limitless patience as I asked question after question about customizing the design. Not only that, but I told them at the outset I wasn't a paying customer and was just evaluating the cart. Even still, they still gave me as much time and help as I needed. I didn't hit the support team with any particularly hard questions, but what was apparent was little wait time and a genuine interest trying to help me as best as possible with my questions. One criticism I would level is that the support people do not have direct email addresses, so if you have an ongoing issue you may end up working with different people throughout the life of a ticket as it is resolved. This is not by any means a major problem, but is worth mentioning. A second criticism I would level is that one of my support requests went unacknowledged. I had sent in a question by email asking if it is possible to detect an IP address on the home page and forward the user to a regional store. I was asking this question in order to gauge Volusion's capability for multi-currency payments support. At the time of writing of this review I have not received an answer to this question after waiting 4 business days for a response. (Update: several days prior to publishing this article Volusion contacted me to let me that my inquiry had been internally routed to the partner team, as opposed to the regular customer support inbox, causing the communication to be dropped). Volusion is a very modern cart that provides a good customer shopping experience. The act of surfing through a Volusion store feels current and rewarding to the user. The template that I had chosen had lots of clean, negative white space with a large product thumbnail that would be magnified when the mouse cursor was hovered over the image. If that's not large enough the image is still clickable for a maximum resolution image that opens within a lightbox. Of particular note is that Volusion makes good use of AJAX, lightboxes, and in general attempts to minimize screen refreshes to reduce load time and keep the user engaged with site content. For example, when you add an item to the cart instead of refreshing the page a small "Product has been added" seamlessly pops up on the page. The user can click the "View Cart" button to proceed with the checkout, or ignore it and continue browsing the current page without a screen refresh being required. 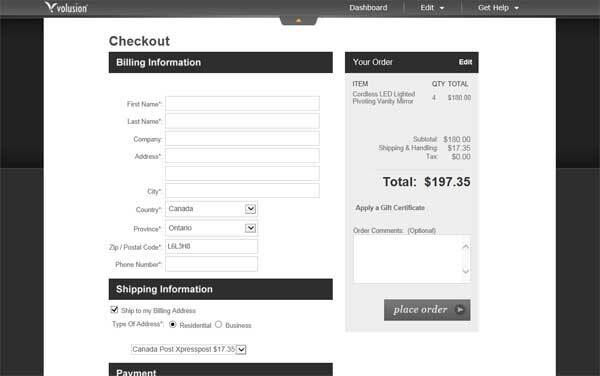 The checkout page is clean and clear, and allows the customer view live shipping quotes in real time. Once you wrap your mind around Volusion's category and subcategory navigation structure you will find that creating and assigning products is a breeze. Ask a merchant with a large catalog about the least fun part of launching their online store. In most cases the answer will inevitably be "data entry". There is no way to make data entry fun, only more pain-free or less pain-free. (Unless you use the Import / Export functionality, in which case you will be in good shape!). 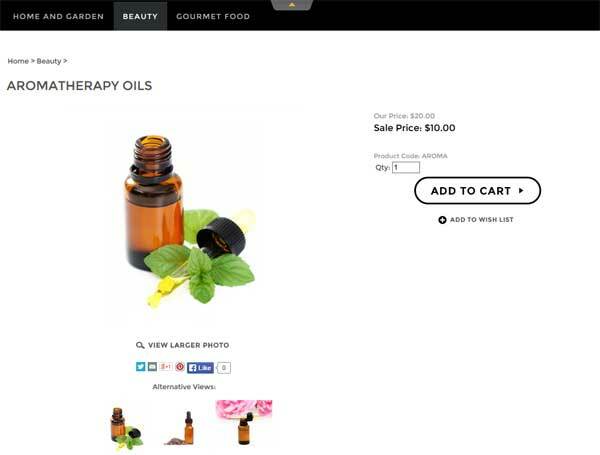 The page interface when creating a new product is surprisingly light and simple. This makes adding new products quick and easy. There are only 5 editable default fields on the page (more if you want to use the advanced features). By eliminating the clutter you should be able to get in and add products to the database relatively quickly. Each product will have a default image assigned to it, with support for multiple high resolution images for each product. I was not able to find the maximum limit of images per product, but was happy with the 5 images I was able to assign my test product. Volusion's clean interface shined through in the product options department. I was able to easily create options for products as I added them to my database. A nice bonus was that I was able to do this without having to refresh or load a different screen. I think Volusion's product options logic was the easiest to use of any shopping cart software that I've used to date. In doing the review I attempted to build a fictitious bean bag chair store. I decided to make it so that if a customer chose to ship a filled bean bag chair it would increase the shipping cost, as opposed to having the chair shipped without the filling. This was very easy to configure through the product options settings. The options logic in and of itself is very powerful. For example, you could make the item have a different shipping weight based upon the options the customer has selected. Or, if you have setup a recurring billing product you can make the amount of the recurring billing charge vary depending upon the options that the user has selected. Volusion made setting up product options, and more importantly, configuring various product options to impact price extremely simple to understand and configure. I mentioned above that Volusion is feature packed. It has more functionality than the typical small business will likely be able to take advantage of. What's more, most of that functionality is actually useful. While some shopping carts have laundry lists of features that are hard to implement or take advantage of, the features that I tested should by and large prove valuable to a small business. In this department Volusion gets good marks. Since there is so much functionality I cannot address all of the available features in this review. If you are hungry for a specific feature or function you should surf over to www.volusion.com and try out a free demo. - Stock and inventory tracking. Will notify you when getting low on stock. Store can automatically prevent purchasing additional items once inventory of a product has reached zero. - Volusion has a built in phone order feature. This way operators taking phone orders can keep the product inventory within the store database in sync at all times. The interface to doing this is a little bit clunky (just because sometimes when a customer is on the phone you want to get the order done quickly and do the administrative steps later), however it is a very handy feature if you want to keep your inventory in sync with your store. Also helpful if your merchant account provider does not include a virtual terminal. (At Merchant Accounts.ca we always include a virtual terminal for free). - You can view traffic currently on the site with the Abandoned / Live Carts feature. This will help administrators keep an eye on traffic patterns, hot products, and points in the funnel that could be improved. 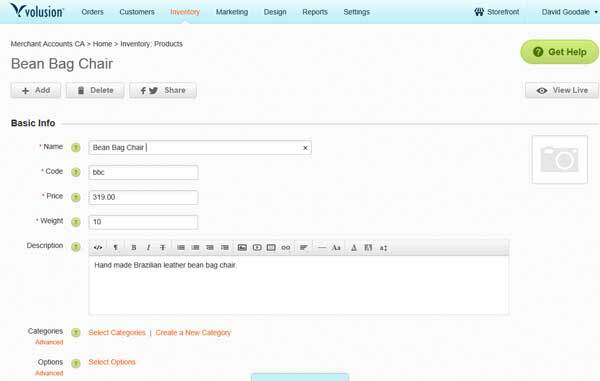 - Social media integration, makes it easy to push messages to Facebook and Twitter from within the cart dashboard. - Email blasts to customers and subscribers. The list of features is too extensive to go over in greater detail. To get a handle on the full list of features and functionality I encourage you to go to Volusion and sign up for a test account. Volusion has extremely robust shipping logic. It supports a veritable laundry list of real time shipping logic including FedEx, UPS, USPS, DHL, Canada Post, Royalmail and Australia Post. In addition to the real time shipping algorithms Volusion supports the more classic weight based logic, per item based logic, and logic driven from combinations of the above. - Free shipping override logic on a per item basis. - Fixed shipping cost override on a per item basis. - Significantly powerful warehouse driven shipping logic for merchants with multiple warehouses/shipping centers. This allows business owners to take advantage of having product in multiple warehouses, or if drop shipping, to charge shipping costs based upon which shipping facility the order will be originating from. Volusion had some of the more flexible shipping logic of any of the remotely hosted shopping cart platforms that I have used recently. 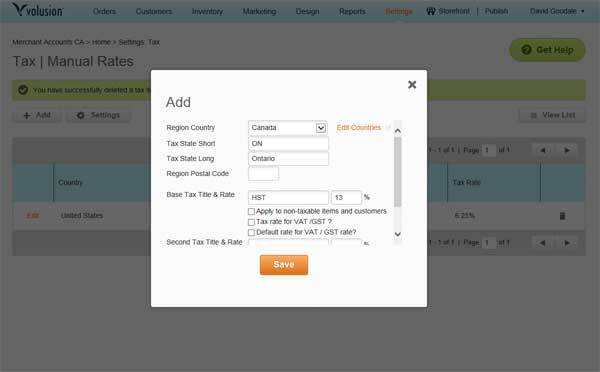 Configuring tax with Volusion is easy and straight forward. Tax is configured per region, on a state by state or province by province basis. Taxes can be applied either before or after the shipping costs are factored into the subtotal. Canadian taxes are easy to setup with 2 tiered federal and provincial tax support built natively into the software. Volusion is SEO friendly out of the box because it's default setting is to use search engine friendly URL's. To a SEO rookie, this means that you can place keywords of the product within the actual filename that is referenced in the URL of the page. Something like www.yourstore.com/red-socks. Using Volusion will absolutely not guarantee you a front page ranking on any search engine. No shopping cart could ever (realistically) make such a claim. However, if you have a knowledge and understanding of search engine optimization you will find Volusion a pleasant platform to work with. As an additional SEO related note, each individual page of the website supports "custom HTML override". This allows you to edit the source code and control the rendering of meta data and HTML title. A minor option, but an important one. Volusion supports a laundry list of gateways across a number of regions. Of course, they are compatible with us at Merchant Accounts.ca! To see the latest list of payment gateways that Volusion supports visit their compatible gateways page: http://support.volusion.com/article/volusion-payment-gateway-integration-information. Volusion comes with built in analytics that can be used to identify traffic, search terms, popular items, click-offs, internal search queries, etc. It also supports tracking of the newsletter functionality to see which emails have been opened by your customers and what links have been clicked on. Volusion's analytics are very helpful, but admittedly basic. Using an additional layer of analytics (like Google analytics) is likely a good idea, and is supported out of the box by Volusion. Volusion is mobile friendly, with a default responsive design that is automatically applied to the store. However, the responsive design is driven from a totally different template than the main store template. As a result, your online store may appear completely different when viewed on a mobile device when compared to the desktop version of the storefront. The mobile storefront is editable so that this can be addressed as desired. It's worth mentioning that the link to preview the changes I was making to the mobile template in the control panel was not working. I think this was because my store was only a test store and I had not moved over an actual domain name to Volusion. At the time of this review Volusion offered 4 tiers of pricing from as low as $15/month (limit 100 products) to $135/month (unlimited products). Aside from limiting the size of the product database, the most basic version does not appear in any way reduced in functionality when compared to the premium version of the software. For a small to mid--sized merchant this pricing is very reasonable and in line with current industry standards. Volusion is a very mature remotely hosted shopping cart software. It has been around for a long time and shows it's age quite well. Actually, a better way to say that is it doesn't really show it's age at all. It is a modern, current shopping cart with a vast array of functionality that extends well past the core shopping cart functionality. 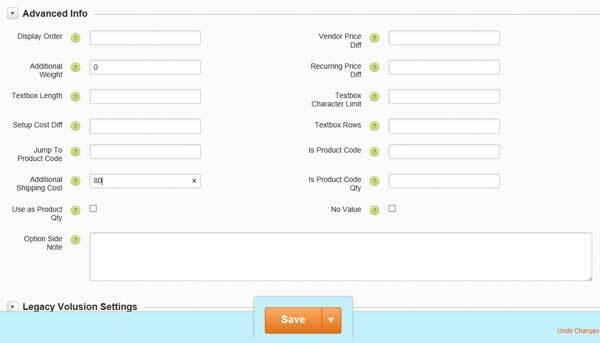 The interface of the cart is clean and the templates (even most of the free ones) are attractively designed. Oddly enough, some of my greatest praise and biggest complaints are both centered around the template system. In terms of the design and customization options Volusion has one of the easiest to use WYSIWYG editors that I've ever seen. If you tie this together with fact that you can get at the pure source of the template it opens the door to do pretty much whatever you want. (So long as you are willing to roll up your sleeves and do some custom coding.) However, intermediate edits can be a bit of a challenge because the WYSIWYG editor has limitations, and editing the source code, while certainly possible, will be beyond the technical capabilities of some users. This may not be as much as a disadvantage as it sounds though, because I believe that Volusion is built with the principle that the vast majority of users should be able to find a suitable pre-existing template from the large repository of templates. There are over one hundred template designs to choose from. For basic and intermediate users, I believe the goal of providing such a robust template repository is to make it so you don't need to do many edits at all. If you pick a template that already closely matches the design you are after, it makes it that much easier to launch. After all, the goal isn't to do unnecessary edits, it is to get up and going with an interface that is professional, represents your brand in a positive light, and is effective. If you can pick the right template it should be a matter of a few small tweaks to get your site polished up and ready for launch. There are quite a number of hosted shopping cart platforms available on the market, and Volusion is one that any small to mid-sized merchant should consider. As with almost any cart, I always recommend trying out a demo before pulling the trigger because (to some degree) liking or disliking the interface of any shopping cart is somewhat down to a matter of user preference. With that having been said, I expect most any person with even a very basic level of technical proficiency should be able to build and launch a successful Volusion store in a short amount of time. It's easy to use, affordable, and a good option to consider in the remotely hosted shopping cart space.